Would Your Dog Wear Yellow? Festival season is upon us and the most prominent image in my mind is the blending of large groups of people and more specifically, lots of dogs and people. Given the impossibility to conjure a protective bubble around your dog if he/she needs a little bit more room to "breathe", there is a new way to communicate this expectation and it is picking up steam. Grassroot efforts like the one I share below is a bright spot on the horizon of human and canine relationship building. I think this is a wonderful, safe way to help build confidence in our dogs. Yellow Dogs are dogs who need space - they are not necessarily aggressive dogs but more often are dogs who have issues of fear; pain from recent surgery; are a rescue or shelter dog who has not yet had sufficient training or mastered obedience; are in training for work or service; are in service; or other reasons specific to the dog. Here’s a list of what a yellow dog is NOT. The Yellow Dog Project encourages people to find their local positive reinforcement trainer and look for programs to help their pets. 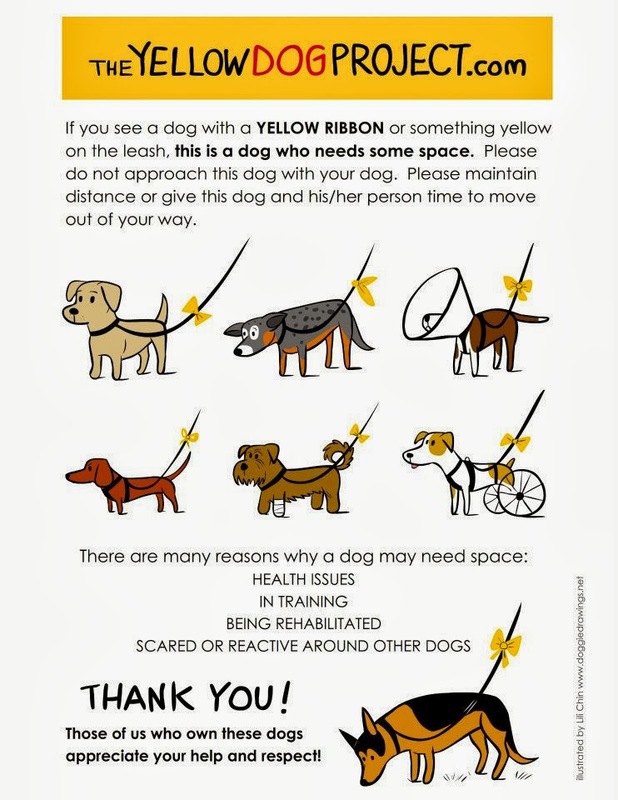 From Grisha Stewarts “Behaviour Adjustment Training” to fearfuldogs.com; Victoria Stillwell to Karen Pryor; Ian Dunbar to Dr. Sophia Yin; and beyond - The Yellow Dog Project encourages all forms of positive training to help yellow dogs. That's a helpful and productive way to promote the welfare of dogs. Bravo!